Katrina Springer is a May 2017 graduate of the joint MAIR/MSPR Public Diplomacy Program. She is a Charles B. Rangel International Affairs Fellow and joined the State Department as a Foreign Service Officer in July 2017. Two years ago–just before I started my studies at Syracuse–I had the incredible opportunity to intern in the personal office of Senator Chuck Schumer. 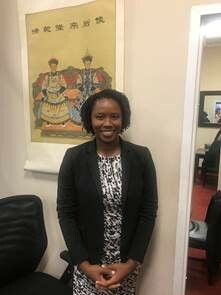 When I decided to attend the joint Maxwell/Newhouse Public Diplomacy Program, I knew that I would be spending the last semester of the program in DC, and I knew that I wanted to return to The Hill. My goal was to experience another side of Congress in hopes of gaining a deeper understanding of the legislative process. Last semester, I interned with the Committee on Foreign Affairs in the U.S. House of Representatives. I quickly learned that the House and Senate share the Capitol, but they are worlds apart. I also learned that while many of the skills from my Senate internship were transferable, personal offices and committees operate differently. Every aspect of my internship provided insight into the critical role of committees in our legislative process. From standard administrative tasks—drafting responses to constituent mail, compiling press clips, greeting visitors, and answering phones—to assisting staffers on more substantive projects and preparing for official committee business, I truly came away from my internship feeling like I’d learned a lifetime’s worth of knowledge about the complex U.S. political machine. One of my most memorable experiences was collecting more than 160 signatures on an Anti-Semitism letter addressed to President Trump. Luckily, this was a team effort and I did not have to collect the signatures alone. The entire experience—from formatting the letter, to running to member offices, and addressing the letter to the White House—was surreal. Watching major media outlets cover the letter for the next couple of days was also quite the experience. It probably goes without saying, but being in Washington for the “First 100 Days” of the Trump Administration was interesting to say the least. When the new administration proposed significant budget cuts to the foreign affairs and aid budget, the members of the Foreign Affairs Committee voiced bipartisan support for the diplomatic community and its important work; I was heartened by this seemingly rare demonstration of unity in the current political climate. As someone who will soon join the Foreign Service, I truly value the time I spent with the Foreign Affairs Committee. I am thankful for the Maxwell-in-Washington Program for allowing me to incorporate this enriching opportunity into my academic experience.